Isn't anything with rice so fulfilling? Add a good egg and it just elevates the whole dish. Tonight a little wok fried beef, scrambled duck egg, quick fried pea vines and a good helping of white rice. Marinate the flank steak for about half an hour. Heat wok to smoking hot over high heat. Add 2 tbsp vegetable oil and then the flank steak. Fry until beef is seared on the outside. 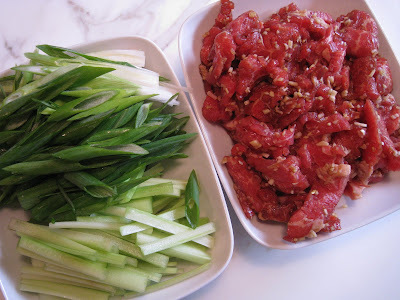 Add hoisin sauce, scallions and celery and fry for a couple more minutes. I bought a half dozen fresh duck eggs from the farmers market on Sunday. Beat 3-4 eggs together with a bit of sugar, a large pinch of salt and a splash of water. Cook eggs in a medium fry pan until just solid. Wok fry the pea vines in a little oil and salt until just wilted. A word on pea vines. When you buy them, you will likely have to rim off some of the tougher portions of the vines as well as the little tentacles, if you will at the top. The way to tell what's tender is that it will break off easily when pinched with your fingers. If you have to use a little muscle, then it's too tough. Besides the poor plating of the dish, it was really, really tasty. I smiled at the sight of the girls giving up on their chopsticks and forking the rice slathered with the sauce into their mouths.